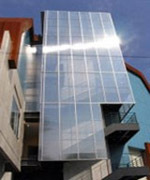 Poliron is a high quality, multi-wall polycarbonate glazing sheet. This product has thin wall tunnel rectangular structure, which may be an excellent candidate for vertical and curved applications. Also, it offers high impact strength, excellent light transmission, light weight, easy installation, long-term weather resistance, outstanding thermal insulation properties. These sheets are an excellent glazing material with remarkable properties making them the ideal choice for light transmitting constructions in the industrial, commercial, domestic and leisure segments. PC hollow profile sheet are light ( less than 1/6 the weight of a sheet of glass of comparable thickness) and easy for moving or installations. Only Periodic cleaning with Water or by using Moist cloth. PC Hollow profile sheets are very easy for installations because they are very light and easy to handle. Because PC Hollow profile sheets are light than comparable thickness of Glass or other material and customer could save more money and reducing life-cycle cost. PC Hollow profile sheet are very durable and long lasting by virtue of their high impact strength and UV protection. PC Hollow profile sheets have better Thermal Insulation properties than other light Transmitting glazing materials, thus making them the first choice for energy efficient Light Transmitting Constructions. This property of PC Hollow profile sheets leads to Tremendous energy saving , resulting in huge cost saving. Clear, blue,green, bronze, gray and Opal white color. These 6 colors are our bulk ordercolor and we can offer customer periodical. If special colors booked we can accept to produce for customers but please follow up our production schedule then confirm the shipment delivery time.The other colors could see our 24 holes sample card. Copyright © 2011 New Era Industries (SMC PVT) Ltd . All Rights Reserved.